The most comprehensive and definitive guide to date on raising all-natural poultry, for homesteaders or farmers seeking to close their loop. The Small-Scale Poultry Flock offers a practical and integrative model for working with chickens and other domestic fowl, based entirely on natural systems. Formulating and making your own feed. How to breed and brood the flock (for breed improvement and for genetic conservation), including the most complete guide to working with broody hens available anywhere. Providing more of the flock's feed from sources grown or self-foraged on the home place, including production of live protein feeds using earthworms and soldier grubs. Using poultry to increase soil fertility, control crop-damaging insects, and make compost—including systems for pasturing and tillage of cover crops and weeds. Step-by-step butchering—one of the best guides available—complete with extensive illustrative photos. 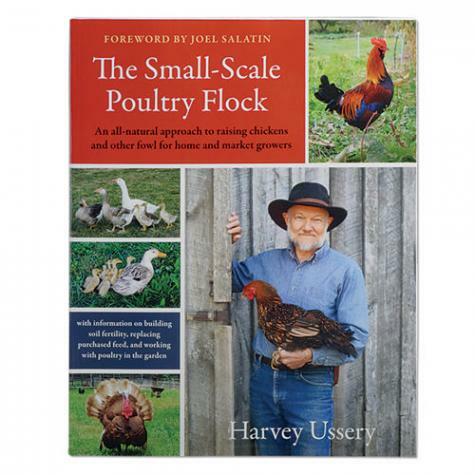 No other book on raising poultry takes an entirely whole-systems approach, nor discusses producing homegrown feed and breeding in such detail. This is truly invaluable and groundbreaking guide that will lead farmers and homesteaders into a new world of self reliance and enjoyment. By Harvey Ussery. Foreword by Joel Salatin. Softcover. 382 pp. I'm new to chickens, but I have read a healthy number of books, magazines, and online information in preparation for getting birds. This is hands down the best book I've read. I really like Storey's as a quick go to for information. However, this book is a comprehensive how-to for not only caring for birds, but putting them to work on your farm/acreage/backyard. Salatin is an excellent writer: concise, clear, and witty. I highly recommend this work.